Reservation Genie released a new concept that promotes restaurant off peak hours called the Diamond Tables Club. The new site targets customers who want to splurge with marketing messages like “Save Big & Indulge” and “Order that Extra Bottle and Dessert!” Customers receive a ‘25% off the check’ promo that applies to the full bill and helps them save more by spending more. Restaurants that sign up before January 1st, 2018 do not pay a monthly fee; Restaurants that sign up after will pay the normal $99 per month membership fee. Adding your restaurant to Diamond Tables is super easy and only takes 5 minutes. You simply fill out a form that includes your contact info, times to promote, and the mobile phone numbers of the managers you wish to receive booking confirmations via SMS. The Reservation Genie team will configure your account for you. 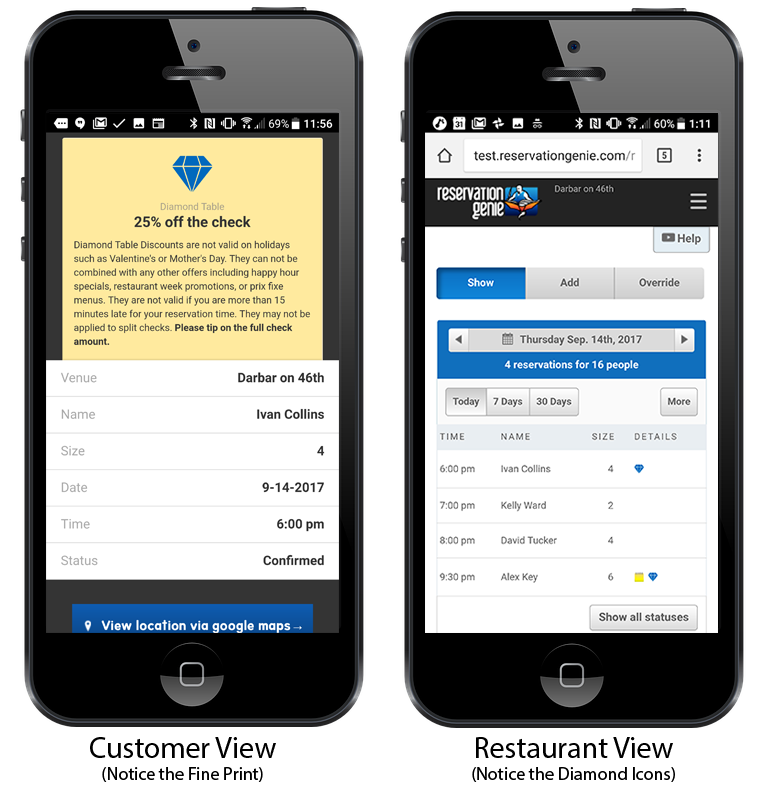 The Diamond Tables site will then feature your restaurant in search results based on the days and times you offer. When customers book, you will receive an email and text message with a link to reservation details notifying you that you have a new Diamond Table booking. Reservations also show up with a diamond icon beside them in your reservations screen. 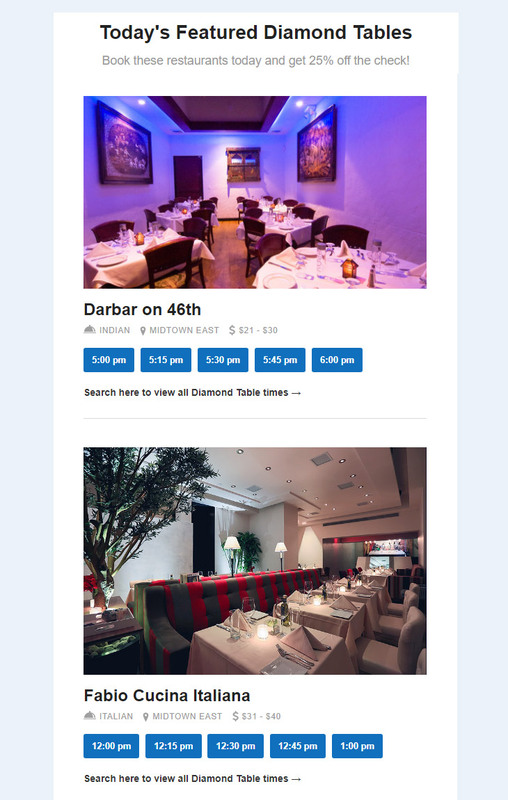 Customers also receive an email and text message with a link to show the Diamond Table booking to their server. You can view both of those below. We recommend offering at least a few times slots every day if possible. This will market your restaurant the most. The Diamond Tables site starts with a search. Customers enter a date and party size and the search results showcase restaurants and the times they offer that day. If you do not offers times that day, you will not show up in search results for that day. The more times you offer, the higher up in search results you’re listed. The site also uses a randomized email marketing strategy that showcases a particular restaurant or group of restaurants every day (see sample email below). If your restaurant doesn’t feature times that day, then it gets skipped. So the best odds of showing up in all search results and email marketing is to include at least some times every day. Reservation Genie encourages restaurants to start out with generous times and then later limit inventory based on booking volume. Lacks Transparency: Restaurants can not see which customers have booked Pop tables. So they can arrive late and still get the incentive. They also can’t gauge the quality of the customer and it makes it easy for the customer to game the system and sit at the bar and order an appetizer and a drink. Negative Incentive Structure: Because the customer gets $10 gift card regardless of how much they spend, they save more percentage wise by spending less. Delayed Gratification: From the customer’s perspective, they have to wait to receive a dining check in the mail after accruing a certain balance vs. receiving the incentive in real time. The Groupon model is frequently noted for sending low quality customers that never return, leave bad reviews, and don’t spend much. Diamond Tables eliminates all of these issues with the Groupon structure. Encourages Lower Spending: Customers pay X to receive a set discount of Y such as Spend $10 to get $20. The nature of receiving a discount on a portion of the bill instead of the entire bill incentives customers to avoid spending more. This leads to skimping on orders and avoiding drinks. Lacks Transparency: The new Groupon model tracks and discounts customers based on their credit card used so the restaurant owner never knows which customers are using the system. Doesn’t Target Off Peak Hours: Customers can use the incentive whenever they want and that will lead to displacing a full priced customer during peak hours if seating is limited. Expensive: Groupon aims to keep approximately 50% of the revenue generated by the Groupon purchased. So if $15 buys you $30 off, the restaurant portion of that is approximately $7.50 out of $30. That’s a net of 25% vs. 75% with Diamond Tables. Those numbers vary considerably depending on the offer structure and the final amount spent, but it can lead to a considerably higher percentage incentive. Restaurant Week only happens once or twice a year, depending on who manages it in your city. So it’s limited in how and when it can help your sales. Many restaurant feel like they have to participate just to avoid a total loss during that period. Diamond Tables eliminates all of these issues with Restaurant Week promotions. Weak Experience Can Lead to Weak Reviews: Because you’re forced to deliver at a specific price point, most restaurants feature less expensive items to customers like chicken, pork, or salmon entrees. That or even reducing portion size. This inevitably leads to customers being unimpressed and consequently weak reviews. The end result is unhappy customers, bad reviews, and barely breaking even. With Diamond Tables, the customers are encouraged to splurge and buy the extravagant items which leads to more embellished reviews. Limited Seasonal Use: Restaurant week is turned on in full force during its promotional period and then turned off entirely. Diamond Tables offers flexibility to scale perfectly with busy hours and seasons. You can enable more times during slow season and you can limit the total number of people booked per time slot during busier seasons.This lets you pick and choose when to use it and how much volume you want from it. Difficult Profit Margins: Restaurant Week requires you to deliver a full meal for a specific price that is frequently 40-50% lower than your per person average. Because the incentive with Diamond Tables is capped at 25% off the check, it still delivers ~40% in profits when food costs are near the typical 35% point because service, kitchen, rents and other costs are fixed costs and do not vary considerably with Diamond Tables bookings. There’s absolutely no risk to trying Diamond Tables. We can have your account set up and start sending customers in less than 24 hours. 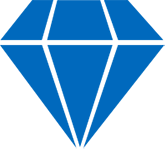 Simply use the button below to register and add your restaurant to Diamond Tables today.